Not quite sure what Nivelle Nights is? No worries. Read on for a Q&A on this all-new map – and learn how to own the night. 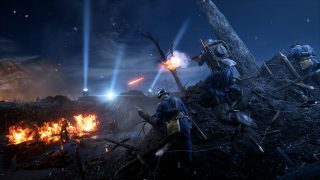 Nivelle Nights is the first night map for Battlefield 1 and builds upon the theme of the Battlefield 1 They Shall Not Pass expansion pack, focused on the French army and the Western Front. You’ll fight during night time on the muddy battlefields around Malmaison and Soupir, where the French and German armies clash. Expect tight corners and limited sight lines in the trench areas of the map, and open, more dangerous areas in No Man’s Land. How can I play the map? If you’re an owner of a Battlefield 1 Premium Pass and/or Battlefield 1 They Shall Not Pass, you have access to Nivelle Nights. You can also take advantage of Premium Friends, which (when active) lets you play the map if you squad up with a Premium Pass owner. What game modes can I play on Nivelle Nights? 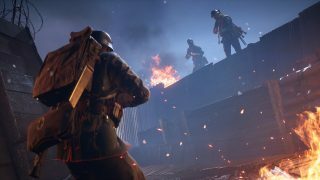 Except for Operations, you can play all the game modes of Battlefield 1, including Frontlines. Frontlines can be described as a mix of Conquest and Rush where the two teams fight for chained control points in a tug-of-war frontline, one flag at a time. Frontlines is great on Nivelle Nights – make sure you give it a go. What weapons and vehicles are available on Nivelle Nights? All weapons from Battlefield 1 and the They Shall Not Pass expansion pack are available on Nivelle Nights. In the game modes that support them, you’ll also have access to vehicles like tanks, cavalry, and more. How does the night time affect the gameplay? As on any Battlefield 1 map, you shold keep your eyes peeled for enemies and with the limited light of Nivelle Nights, this is essential. You’re not fighting in total darkness though; the moon, the searchlights, and the artillery will light up the night skies. You can also find some flare rockets on the map to light up parts of the battlefield. Now that you’re prepared for battle: deploy and own the night. Enjoy Nivelle Nights – and see you on the battlefield.